Three options are available on the IR2BTci for tracking the power status of the PlayStation 3. The first is called “Smart Track” and uses an internal variable to remember which state the PS3 is in. When the adapter thinks the console is off, it ignores all commands except for [Power On]. Once the console is on and the adapter receives the [Power Off] command, the shutdown macro is transmitted and the adapter goes to sleep, waiting for the next [Power On]. This offers some degree of reliability for system automation macros, but if the console is used manually or if it doesn’t shut off as it should, the IR2BTci can easily become out-of-sync. To improve upon that situation two other hardware-based methods can be used. The first requires hooking up a standard USB cable between the PS3 and the IR2BTci’s “USB Sense” port. Only when the PS3 is running does it supply power to its USB ports, so the adapter uses that to know – for sure – whether the console is turned on or off. The second method is “AC Sense”, which requires the purchase of the Xantech SMMAG01 Magnetic Sensor Module. This is available direct for $45, and monitors the amount of current running through the console’s power cord. Should Sony ever change how the PS3’s USB ports operate (for a period they did supply power when the console was off), this could prove a valuable feature. Power monitoring can also be disabled entirely. 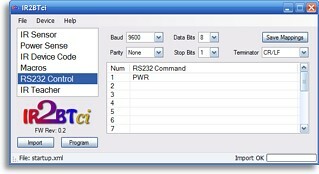 The IR2BTci features 4 user macros, each with up to 8 commands. Each of these commands can have a custom hold time (such as when you need to hold the [PS] button for a few seconds), plus a subsequent delay. One macro is mapped directly to the [Power Off] command, while the other 3 are given custom IR trigger codes. 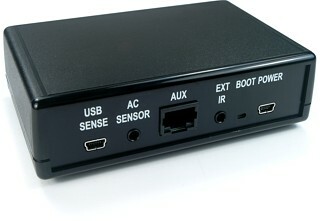 One of the wholly unique features of the IR2BTci is the RS232 (AKA serial) output capability. With this the unit can be hooked up directly to an RS232 device such as a projector or a receiver, and become a lightweight IR-to-RS232 converter. 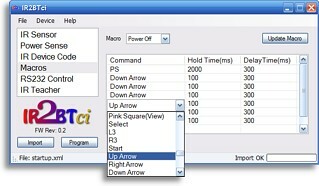 Up to 16 commands can be configured in the software, and each one is assigned its own IR trigger code. These commands can also be referenced from internal macros. Finally, the IR2BTci is firmware upgradeable. The company’s first PS3 product, the IR2BT, had an issue when Sony made a change to the PlayStation 3’s software that specifically prevented it from communicating with the console. The issue was corrected; however that version of the IR2BT could not be user-upgraded and had to be sent back for an upgrade. So when it came time to create the IR2BTci, it was essential to ensure that its firmware was field upgradeable. Pairing the IR2BTci and the PlayStation 3 is a simple process. First, remove all power from the adapter and then select remote registration on the PS3. When the console is ready, re-apply power to the adapter. Within 15 seconds, press and hold the  button on your remote for several seconds or until the PS3 finishes registration. That’s all! A full website is provided for the IR2BTci, including downloadable manuals, hex codes, a few remote-specific configuration files, as well as a support forum.